This newly released HiRISE image shows the North Polar layered deposits on Mars, which are a 3-kilometer thick stack of dusty water ice layers that are about 1000 kilometers across. The layers record information about climate stretching back a few million years into Martian history. In many locations erosion has created scarps and troughs that expose this layering. 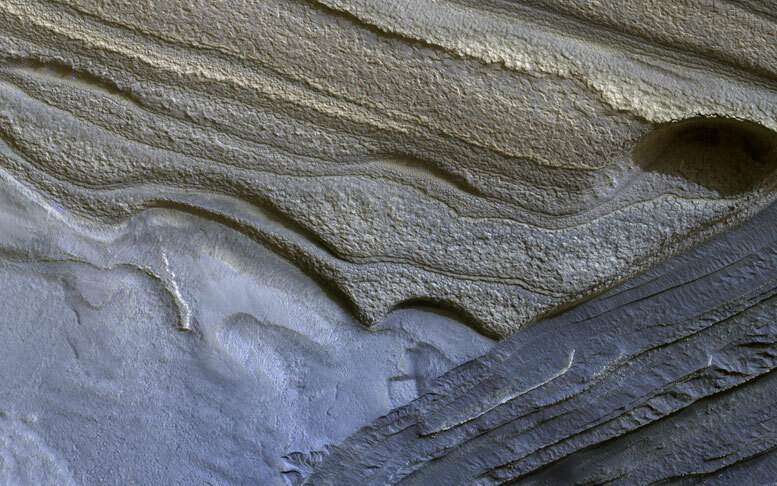 The tan colored layers are the dusty water ice of the polar layered deposits; however a section of bluish layers are is visible below them. 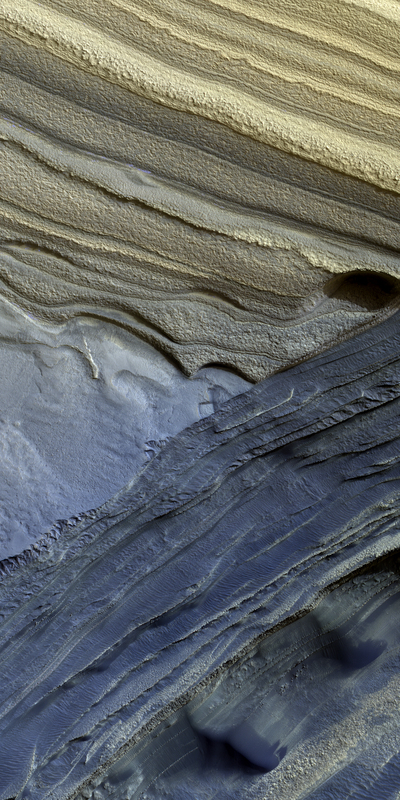 These bluish layers contain sand-sized rock fragments that likely formed a large polar dunefield before the overlying dusty ice was deposited. The lack of a polar ice cap in this past epoch attests to the variability of the Martian climate, which undergoes larger changes over time than that of the Earth. The map is projected here at a scale of 50 centimeters (19.6 inches) per pixel. [The original image scale is 63.6 centimeters (25 inches) per pixel (with 2 x 2 binning); objects on the order of 191 centimeters (75.2 inches) across are resolved.] North is up. Be the first to comment on "NASA’s HiRISE Views North Polar Layers of Mars"